When the weather gets cooler and the leaves start to change colors, pumpkins suddenly become the center of attention. You find them in stores, on your porch, in your holiday pie. Pumpkins even find their way into your cup. We will discuss the health benefits of our favorite fall gourd and ways to add pumpkin to your diet. 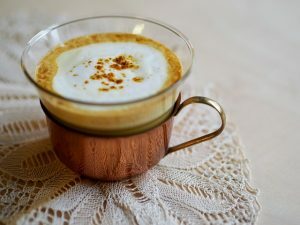 Finally, we will show you how to make a healthier version of a pumpkin spice latte right at home. 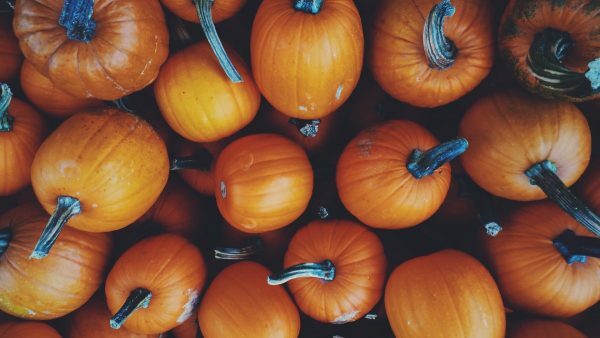 Not only are pumpkins fun to carve, eat, and drink, but did you know they are also full of nutrients? Here is an even bigger surprise. Pumpkins contain seeds, so they are actually a fruit– not a vegetable! Beta-carotene is also changed into vitamin A in the body. Vitamin A can help your body fight off infection, especially those threatening your intestine. Don’t forget the crunchy treats inside your pumpkin! Pumpkin seeds are a good source of magnesium, which is important for bone health. They also boost heart health with omega-3 fatty acids and antioxidants. How can you get more pumpkin in your diet? 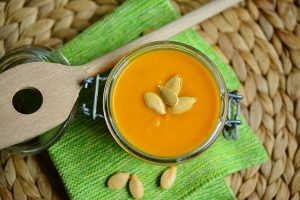 Try making your own pumpkin puree by cutting a small pumpkin in half, scoop out seeds, and place halves cut side down on a rimmed baking pan with about a 1/4thinch of water. Bake at 300 degrees F for about an hour or until fork tender. When cool, cut away skin and mash or puree. Don’t forget about those seeds! Roast them for a tasty snack. When buying it in a can, choose pumpkin puree instead of pumpkin pie mix to get more pumpkin and less added sugar. Replace butter or oil in baking recipes with pumpkin puree. Replace every 1 cup of butter or oil with 2/3 to 1 cup pumpkin puree. For example, if a recipe calls for one cup of butter, use between 2/3 cup and 1 cup pumpkin puree instead. Remember that a pumpkin flavor will be added to whatever you are cooking. Now for the moment you have all been waiting for. Grab your favorite mug and get ready for a healthier version of your favorite fall drink right at home. Combine the milk, pumpkin puree, maple syrup, pumpkin pie spice, and vanilla in a medium microwavable safe bowl. Cover the bowl with plastic wrap and vent with a small hole. Microwave until the milk is hot, about 1-2 minutes. Whisk vigorously until the milk mixture is foamy, about 30 seconds. Pour the coffee in a large mug and add the foamed milk.